It is rare to see a top professional mentalist at the peak of his career work for a lay audience. 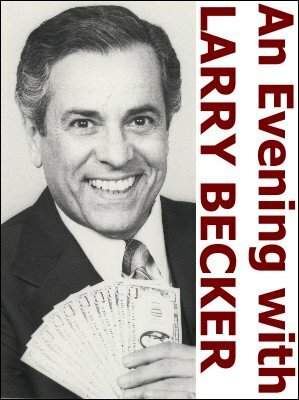 Here you can study how Larry Becker handles and interacts with his audience, what he says, and what he doesn't say, where he jokes, and how he uses laughter to misdirect. One can clearly see that Larry loves his audiences and while he doesn't mind frying their brains, it's most important to him that he connects with them and that they truly enjoy the experience. He is first and foremost a people person. You might have or adopt a very different personality than Larry Becker. Nevertheless, anybody who aspires to perform mentalism better will learn a great deal from this recording. Please do understand that this is a home video. This was not shot or edited by professionals. The video as a whole is a bit dark and there is one brief moment where somebody is standing in front of the camera. Despite these technical deficiencies one can clearly follow every effect and hear what Larry and the audience say. April and I moved from Florida to Arizona in 1990. We built a home in a small town north of Scottsdale called "Carefree" (current population approximately 3500). The name of the town is a fitting description of the lifestyle we have enjoyed for many years. Shortly after settling in, we were approached by members of the local, Desert Hills Community Foundation. They filled us in on the organization's activities which included many worthwhile civic endeavors. Funding for the organization was sustained by memberships, donations and proceeds from such activities as home Musicales. They went on to explain these events included cocktails, dinner and entertainment by talented musicians. The expense for these events was provided by two or three couples, one of whom would host the musicale in their home. Attendance was usually $70 to $100 per couple. April and I were beginning to understand the character of the unique community we had joined. I stated that we were so new to the area, we didn't think we could ask one or two folks to co-sponsor the event and I was not a musician...I was a MAGICIAN. Everyone smiled as they explained that there were no boundaries with regard to the kind of talent that performed. Our home and I had been enlisted to provide a Musicale for the community. We had our living room furniture removed and stored. We hired a caterer complete with bartender and waitresses. We had tables placed around our swimming pool and a bar setup. We hired a keyboardist to provide musical interludes and to accompany the entertainer (yours truly). Our living room furniture was replaced by two banks of folding chairs for the attendees. The musicale was a sellout. A friend asked if he could video the event. I said, "of course, why not?" The event was scheduled for early May 1990. April and I decided to take a short vacation prior to the Musicale. We visited our favorite Mexican resort town of Cabo San Lucas. While there I drafted a rough outline of the show I was going to perform. Now you can enjoy this time capsule recording of one of the most celebrated mentalists alive.